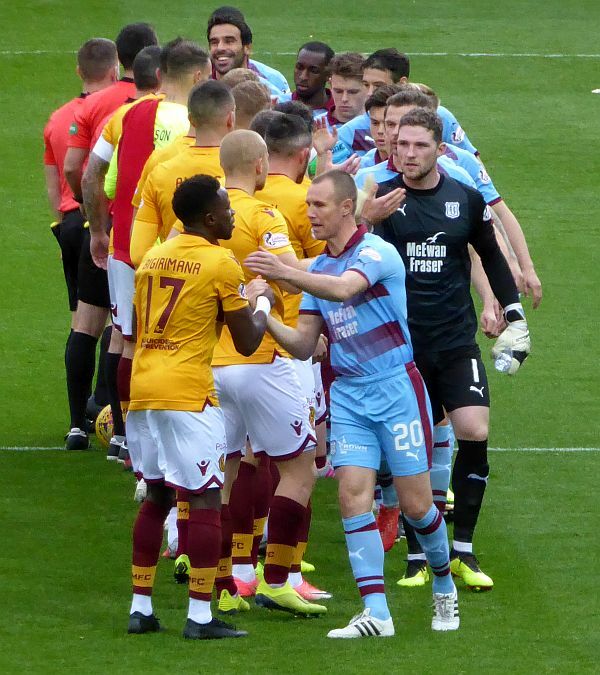 A thundering firecracker from David Turnbull delivered a second victory in four days for Motherwell against the bottom pair in the table. Dundee had no reply and we gain some breathing space with the first home win of the season. This was a big week for Stephen Robinson and his team passed the test of the crucial double header over St Mirren and Dundee and grabbed six valuable points. And ‘Well supporters get to enjoy a rare Saturday night to celebrate a home win. There was no surprise in team selection as the same eleven that won on Wednesday kicked off in the strong blustery wind that played its part all afternoon. There was action in both six yard boxes in the opening two minutes. Aldred was deceived as a crossed ball arrived but we escaped without damage. Play roared to the other end thanks to the first of many powerful runs from a rejuvenated Cadden and Hamilton was relieved that the two shots that followed were blocked. We rode our luck in 10 minutes when a corner on our right was headed by O’Dea. A goal looked certain when the bounce off the woodwork caused a scramble on the goal line but a desperate boot saved the day. We looked more composed than in the earlier part of the season with Turnbull and Bigirimana happy to take a touch or two before finding forward pass. There were willing runners up front and several chances resulted. The half ended with a first time effort from McHugh that came close. Grimshaw had us claiming for a penalty two minutes into the second half when his run came to a sudden halt but referee Robertson was not persuaded. Main shielded the ball to give Turnbull a shot but Dundee legs blocked his effort. Grimshaw did well to deliver an inch perfect pass for Cadden’s surging run on the left. The cross that followed was perfect for Bowman but his headed effort passed the post on the wrong side. The game was won in with 20 minutes remaining. Turnbull collected in space 30 yards out and set himself for a shot. He made great contact and the ball flew to Hamilton’s right with enough pace to crash into the net. We have to hope that news of a contract extension comes very soon. Late substitutions followed as we withstood the Dundee surge that followed but we held on to complete a second clean sheet of the week. The result extends our buffer zone over the bottom pair and goes some way to repairing the damage of our stuttering start.